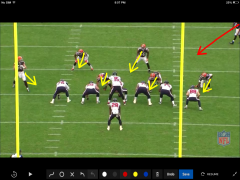 Another feature for Browns Beats will give us a feel of how the players, if they so choose, can get better. 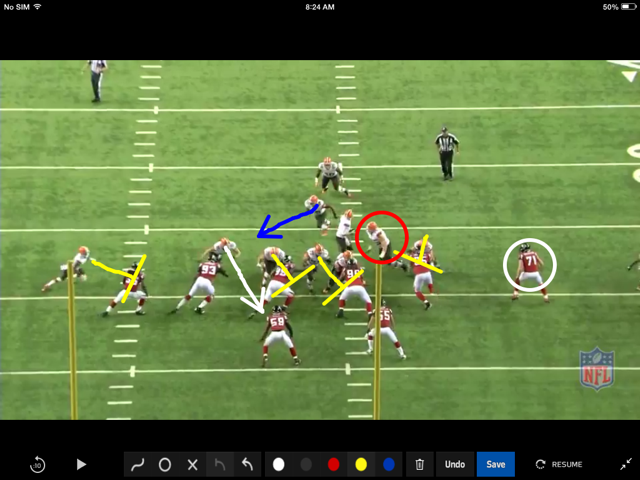 The abilities of both Josh Gordan and Terrance West have tremendous value to the Browns. If they decide to use the strength of mind to focus on some additional details that will help them be bigger differences for the team. First up is T West. The team has called a Power running play to the right. 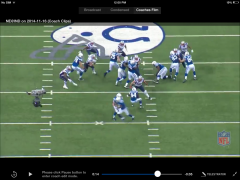 Terrance should attack the Right A Gap (between the center & right guard) and get behind the left guard. You can see based on the drawing of the blocking scheme that the o-line is turning everything to the right of the picture and #71 is free. The red arrows say no to the runner. Based on the blocking scheme there is no way that running to the left be considered, UNLESS a free runner is on the front side. The yellow lines are the yellow brick road. Terrance should be in J Bitonio’s back hip. Don’t do it T West. Note #71 is still free on the backside. Based on the blocking scheme, practice and film review, Terrance should know this. Oh hell no! He did it! He’s trying to go where the people are being blocked and where the unblocked defender is. If he stays with Bitonio, he has the potential use of his COD to get outside and perhaps do some real damage. To me, this is a clear indication that he is taking the ball and just running. He either doesn’t have the ability to understand or just doesn’t consider the blocking scheme prior to getting to his assigned alignment. He is just getting basic direction in the huddle, lining up and not working a pre-snap read. This will take some want to and discipline from him but will help him be a better runner, pass protector and receiver, if he chooses. Room to grow and hopefully motivation not to continue to work against his blockers as opposed making them better. Now to Mr. Gordan. He was impactful in this game. As we all know, not playing all of the season has benefits health wise but we also know it takes playing football to get better at it. We all knew he would have a few plays he would want back. 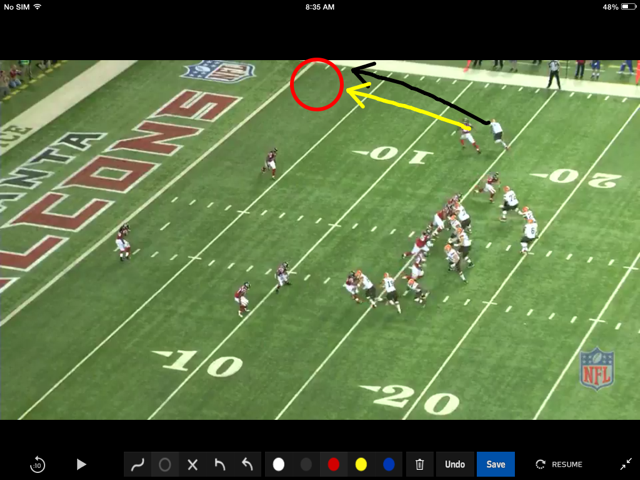 Below he is running a fade route vs Trufant. The Falcons decided to match them most of the day. Gordan gets a easy release. He continues to fade towards the pylon. 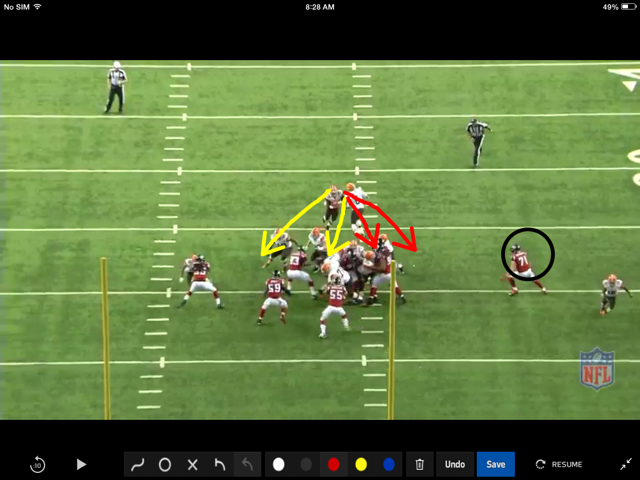 As you can see,Trufant stays with him and takes up the ground Gordan is giving him. 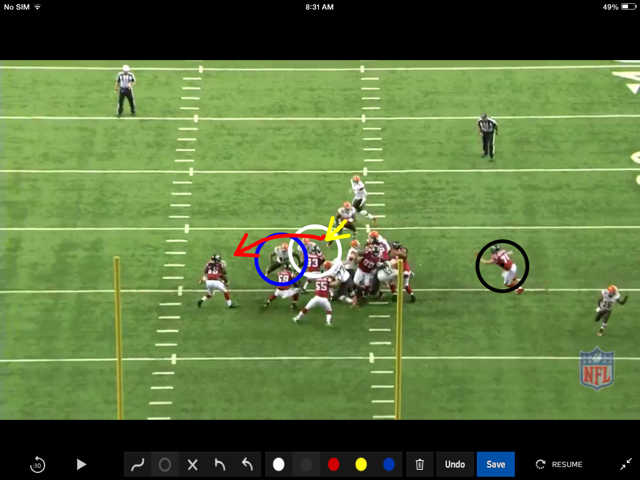 (To easy) This gives no room for error and doesn’t help JG use his size and athleticism. The way he ran the route actually helps the defender. The black arrow is the death route. Even a back shoulder throw is dead here. The Red circle is the area where he should fight to get to. After the release he would have to straighten up Trufant. That may create some physical interaction. 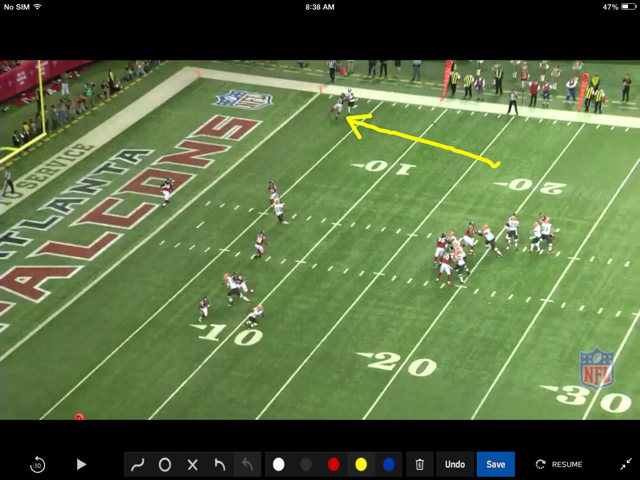 You can see if he ends up at the tip of the yellow arrow, it will give him and Hoyer some additional options. Yes Hoyer can still throw a jump ball to him here. The other option brings in another variables. PI and perhaps a fade to the back pylon. THE HOPE IS THE “GAME WITHIN THE GAME” PLAY WILL CONTINUE TO GROW AS T WEST AND JG MAKE THE DECISION TO GROW MENTALLY. THE ADDITIONS TO THEIR GAME WILL MAKE THEM MORE DANGEROUS AND HELP THE BROWNS BE A BETTER TEAM.